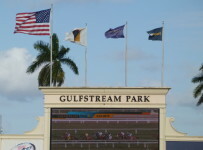 Friday’s racing card at Gulfstream Park will feature 10 races with a first post of 12:35 PM. A field of 90 horses is listed on the race card, but will no doubt be a bit lower with the scratches. Races 3,7,8,and 10 are scheduled for the turf, and the weather folks tell us a 10% or less chance of rain is expected. The morning track is listed as sloppy on the dirt and good on the turf. The late races are jammed with up to 12 entries, as the last 6 races are listed with 61 starters as of this morning. Two two-year-old races saddle up in races 7 and 10, making the Late pick 4, pick 5 and Rainbow 6 more challenging. In Thursday’s action, 83 starters chased $316,500 in purses in the 10 races. 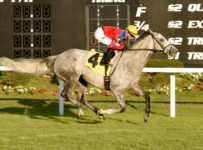 Just one favorite won the day, and two races were off the turf. A couple 7:1 odds runners, and a 10:1 shot won the last 6 races provided for decent payouts:. The late multiple race wagers paid out $305.95 on the Pick 4, $2,332.55 on the Pick 5, and $3,162 on the Rainbow 6 to 25 winners. The Rainbow 6 pool size and carryover is growing rapidly, and the jackpot today is $265,298, entering it’s 10 day of the Championship Meet that started December 1st. Race 5 will kick off the Rainbow 6 wager with an approximate post time of 2:33 PM.